COPYING HISTORY-PRESIDENT 45 AND HIS GANG-DID LINCOLN DIE FOR NOTHING? Why, for two hundred years, have some American citizens seen this country as an endangered Eden, to be purged of corrupting peoples or ideas by any means necessary? To the Know-Nothings of the 1850s, the enemy was Irish immigrants. To the Ku Klux Klan, it was Jews, blacks, and socialists. To groups like the Michigan Militia, the enemy is the government itself — and some of them are willing to take arms against it. 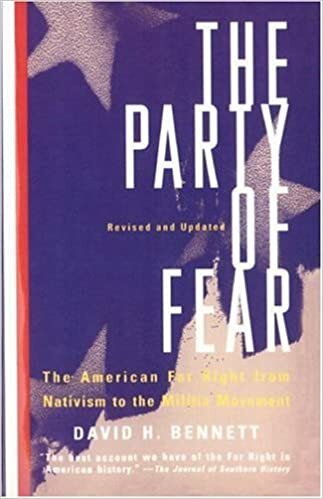 The Party of Fear — which has now been updated to examine the right-wing resurgence of the 1990s — is the first book to reveal the common values and anxieties that lie beneath the seeming diversity of the far right. From the anti-Catholic riots that convulsed Philadelphia in 1845 to the 1995 bombing in Oklahoma City, it casts a brilliant, cautionary light not only on our political fringes but on the ways in which ordinary Americans define themselves and demonize outsiders. The American or “Know Nothing Party” was an anti-immigrant political party of the 1850’s. I am not a Know-Nothing. That is certain. How could I be? How can any one who abhors the oppression of negroes, be in favor of degrading classes of white people? Our progress in degeneracy appears to me to be pretty rapid. As a nation, we begin by declaring that “all men are created equal.” We now practically read it “all men are created equal, except negroes.” When the Know-Nothings get control, it will read “all men are created equal, except negroes, and foreigners, and catholics.” When it comes to this I should prefer emigrating to some country where they make no pretence of loving liberty-to Russia, for instance, where despotism can be taken pure, and without the base alloy of hypocracy. To my Jewish, Irish, Asian and Italian friends, let’s remember:Your ancestors were lower than dirt when they arrived here.Italians were referred to – openly – as a subhuman race of rats and criminals.Irishmen were apes and monkeys. Laws were passed to keep Chinese women out of the country, so that the Chinese males who were brought over for menial labor couldn’t produce offspring. Jews were spat upon in the streets and routinely excluded from polite society. Unhire-able. Undesirable. Laws were passed to allow for the mass discrimination and segregation of your great grandparents, not much more than a century ago. It’s nice that you now view yourselves as “Real Americans.” Just yesterday, your kind were anything but. And I don’t mean in the deep south or in obscure corners of the country. Your forebears were considered human garbage on the streets of New York, Philadelphia and Boston. It wasn’t all that long ago when mainstream politicians were actively seeking ways to get rid of you too. I work on Wall Street and live on Long Island. I am surrounded by people who can’t recognize how recently their own ancestry and ethnicity would have been a problem for them. Are you one of them? If so, I hope this hits close enough to home so as to awaken you from your contented slumber.